Yesterday, things happened just the way they were supposed to happen. I started my morning at a very special graduation. 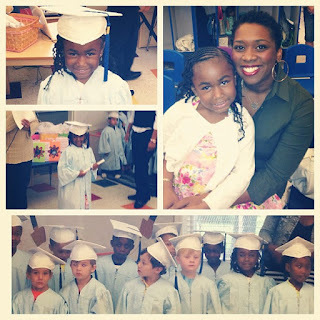 My goddaughter J (who's also my little second cousin) graduated from Pre-K. She did such a great job! She sang and performed to perfection. J is a leader. While I was watching J accept her diploma, I started thinking to myself, "Man, what do I have to do to get a cap and gown?!?" Graduation season is coming to a close and I refuse to let another graduation season pass and not be a part of it. I left J's graduation and went to meet with my advisor. He gave my dissertation a read from start to finish, and I think I'm doing alright. He asked for some changes, but nothing that was too big for me to handle. After having a long talk about how to bring the dissertation process to a close, I think we nailed down a dissertation date! I'll be back with more details soon! Thanks to those of you who've sent your love and support. Until next time . . . I'm grinding to the finish line!